Southeastern United States where it often grows in large masses in ditches and open fields. the way it just seems to 'pop' out of the ground in May. Maypops were eventually renamed as the Passion Flower by missionaries in the early 1500s. the petals, rays, and sepals, symbolized features of the crucifixion of Christ. these 3 inch diameter flowers are very unique and beautiful. They begin blooming in July and continue until frost. The vines can easily grow up to 15 feet in a season. Grow it on a fence or trellis, or simply allow it to scramble harmlessly over your shrubs and trees. Passion flowers are considered to be hardy in USDA zones 5-9, but they should be planted in a protected location and mulched heavily if severe cold threatens. Only the top growth is killed back by frost, but your Passion Flower will pop back to life in the Spring. 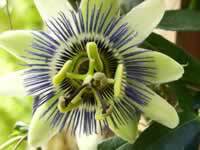 Passion Flowers are easy to grow. They need partial to full sun, and will adapt themselves to most well-drained soils. During the growing season, the soil should be kept evenly moist, to ensure good flowering and growth. Apply a balanced (10-5-20) fertilizer in the early spring, and then again six to eight weeks later. Passion Flower vines should be planted in early spring. They benefit by the addition of compost to the planting hole. The fruit produced by the Passion Flower is an oval berry, a little smaller than a kiwi fruit. Passion Fruit is edible, but it is pretty seedy. It can be used to make jelly, but its best usage may come from being a food source for several species of butterfly and their larvae. Passion Flowers can be propagated by softwood cuttings taken from mature wood in early summer. Softwood cuttings will take 3 months or longer to root. Passion Flowers can also be grown from seed. The seeds must be soaked in warm water for 12 hours, before sowing indoors in early spring. Germination may take up to a year, so be patient. and then plant them outdoors in their permanent homes. Passion flowers make excellent container grown plants in the home. Indoors, grow Passion Plants in bright light but never full sun.